If you are in the UK and have been eagerly waiting for that one special moment when the Samsung Galaxy Tab would finally be a market reality, well here it is. Not that special moment, but at least the precursor to it. 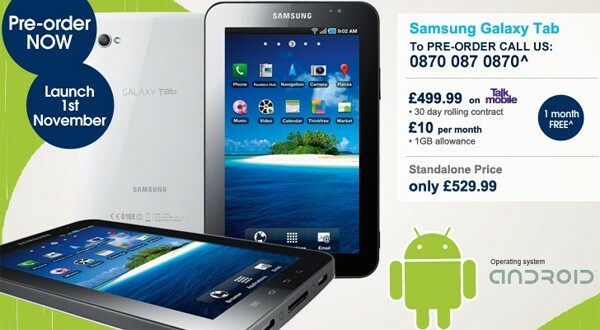 Carphone Warehouse is now accepting pre-orders for the Galaxy Tab while the deliveries will begin on the 1st of November. Price for the Galaxy Tab has been fixed at £530, which turns out to around $850 in US dollars. This is what the unlocked and sim free version of the Galaxy Tab will come for while the same with a 30 day data plan (and not one that stretches for 18 or even 24 month) will cost a bit more affordable £499.99. The data plan includes 1 GB of data usage in a month that will cost £10 and comes as a rolling agreement from Talk Mobile that can be annulled anytime within a month’s notice. Not only are there no penalties involved, but users will also be given a month of free usage after having the contract terminated. With that announcement, the Carphone Warehouse is among the first to come up with firm price details of the Galaxy Tab before it is seen on store shelves. There is still some time left for that to happen, and in the meantime, there is a lot of action likely to take place with the pricing of the highly anticipated tablet. Network operators like Vodafone are yet to come up with firm pricing structures though it’s likely to be highly competitive as they vie for consumer attention. The Galaxy Tab is being touted as the ultimate answer to the iPad and has a lot of things that the iPad does not. Sure it measures a good 2 inches less than the iPad, but has got superior features to make up for that. However, pricing of the tablet everywhere in the world has always been a bit on the higher side and might not contribute to that roaring success that it otherwise might have met with. Let’s just hope Samsung does not smudge things up with their marketing efforts of an otherwise brilliant tablet device. Try out our retail partner Shop e-Readers for the best e-reader deals. They stock some of the most sought after e-reader like the new Kindle, Kindle DX, Sony PRS – 350, Sony PRS – 650, Kobo, or the Barnes & Noble Nook. So if its any of these that you have been looking to buy, well you know where to look to. Shop e-Readers.